Smith Safety & Supply sells industrial safety products and personal protective equipment for the workplace. Protocol Three assists Smith Safety & Supply with Bigcommerce custom design solutions to make the cart do things it can’t and providing SEO marketing services, consultation, and knowledge to poise this ambitious newcomer to find success online within the workplace safety industry. I have been working with Adam from Protocol Three for a while now and I must say that we are, as a website and a company, far beyond where we started. Business can be complicated at times, especially SEO and Website Customization. Adam has simplified this process and helped us implement a lot of things that have made out lives a lot easier while driving traffic to our business. I could talk about a lot of different projects he has been invaluable on but simply he does one thing very well that we also have as a pillar of success in our business. Simply.. they does what they say they are going to do and if they cannot (which is rare), I know immediately. That is unfortunately pretty rare in business but HUGE. I have worked with a lot of other companies that do not hold up to what they say or are full of excuses. 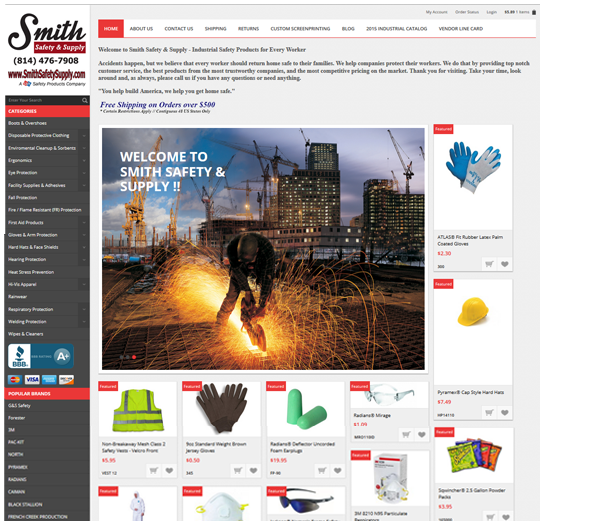 SmithSafetySupply.com provides affordable solutions for workplace safety gear with high-end customer service and a shopping experience that provides ease and convenience for those working hard in potentially hazardous environments. Providing everything from hearing and eye protection, tagout/lockout supplies, to safety apparel such as welder’s gloves and fire-resistant (FR) clothing, companies rely on Smith Safety & Supply to provide them with the best top brands and competitive pricing for the safety supplies they need to return home safe every day. As a relative newcomer, Smith Safety & Supply came to Protocol Three initially for consultation and custom coding solution, but furthered their involvement by allowing us the privilege of providing for their SEO and marketing needs, as well as provide assistance to build a marketing blueprint to grow.